2019 is the year that our city celebrates its 350th birthday. Join us Saturday and Sunday for citywide celebrations! On Saturday morning, May 18, 2019, the Boy Scouts troops 109 and 821 of Westfield will be sponsoring a community pancake breakfast for families and individuals to kick off a full day of activities! From 7:30AM to 11:00AM at the Westfield Middle School (South). The breakfast will feature awesome food and family friendly entertainment and activities. Some of the plans include: music, balloons, face painting, coloring, puzzles, yard games, historic games, dunk tank, and historic photo frames for creating memorable family pictures. Tickets the day of the event will be $3 for youth (elementary and intermediate school age), and $6 for adults (middle school, high school, and adults). Discount advance ticket vouchers will be $2 and $4. On Saturday morning, May 18, 2019, the Friends of the Columbia Greenway will be sponsoring a bike rodeo on the newest section of the beautiful bike trail in Westfield from Main Street to Shaker Road. Decorating bikes, bike safety, bike repair, riding tips and much more will make this a fun morning of riding on the trail for children, parents and residents! On Saturday afternoon, May 18, 2019, Westfield will be once again feature one of the top road races in the area! A certified 5k course with prize money for the top finishers promises great excitement and challenge for runners and walkers combined with a fun block party on Elm Street following the run. Go to www.runwestfield.com for details and registration information. On Saturday evening, May 18, 2019, Westfield will celebrate its 350 birthday with children’s games, music and fireworks in the fields behind the Boys and Girls Club and the Amelia Park Children’s Museum. On Sunday, May 19, 2019, Westfield will be celebrating its 350th birthday with a community parade from Stanley Park to the Park Square Green! 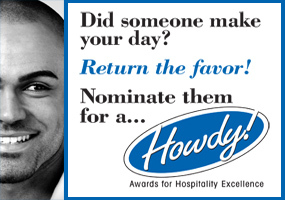 Nominate Someone for a HOWDY Award!